The ideal family consists of a group of people we can depend on, people who love us, nurture and care for us, people who offer their guidance and support as we go through life, people who we trust. Family is the most important influence in the life of a young child. We usually think of family as blood relatives but sadly not all blood relatives have our best interests at heart. Some of the most toxic people we know may share the same DNA. A dysfunctional family background often leads to a child believing that their opinions, needs and desires are unimportant and meaningless. As they mature they often lack confidence with low feelings of self-worth. Depression and anxiety are commonplace. Adult children from a narcissistic family need support to make them understand that they are not inadequate and to help them develop healthy self-esteem and build strong and healthy relationships. In the toxic family neglect and abuse are often a daily occurrence. This family may look good from the outside but it’s a different story for those who live within this dysfunctional family dynamic. Everything is about image. The narcissistic parent will likely put on a display in public and be seen as generous, personable and charming whereas behind closed doors they are abusive and controlling. The house where abuse takes place, whether mental or physical, will never be a home. Talking about their issues is forbidden. (Let’s just pretend everything’s perfect.) Family members who thrive on drama, negativity, jealousy, criticism and denigration will never make a child feel good about themselves. 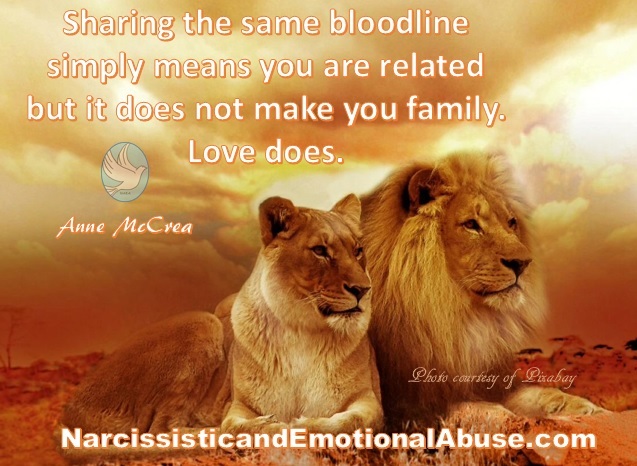 Children from narcissistic families rarely grow up to be close to their brothers and sisters in later life. They have often been pitted against one another in their childhood. Unless the child holds the position of the ‘golden child’ within the family unit, they will be seen and not heard, blamed and shamed. Nothing they ever do will be good enough and they’ll soon learn that their value depends on their achievements, how they can make the family look good and not for who they are. They are verbally or physically abusive. They make you feel that you can never do or say anything right. They play victim to circumstances they create. You feel uncomfortable when they’re around. They put you down more than they lift you up. You feel like you are walking on eggshells so as you don’t upset them. How do you deal with toxic family members? The worst thing you can do is do nothing. By doing nothing you are giving them the impression that their behaviour is ok. Your mental and physical well-being may suffer as a result. Stop giving up a part of yourself to keep the peace and please someone who is impossible to please. Behaviour such as the behaviour mentioned above, will drain you emotionally. Something that I hear so very often is, ‘I wish that I had done something sooner,’ and ‘If only I’d known that this wasn’t normal. I thought all families were like this and I blamed myself.’ For your own sake, establish boundaries sooner rather than later. You teach people how to treat you by setting healthy boundaries. Your boundaries are a set of limits or rules where you decide what is acceptable and what is not. They’ll differ from person to person. Normal healthy people know not to cross the line and should have a reasonable idea when not to intrude. On the other hand, the narcissist personality, will have absolutely no respect for the boundaries you set. They have an extraordinary knack of pushing people to their limits for their own amusement, to create friction or drama or to test you. Setting boundaries with a narcissist will not be a one off thing. Expect it to be something that you will have to address time and time again. Communicate your wishes firmly and directly and don’t let them push your buttons. Remain resolute and leave them in no doubt that you mean what you say or things will go back to the way they were before. Healthy boundaries include ‘alone time’ and time to spend as you see fit. Never let anyone make you feel guilty for setting standards. If they get angry with you for setting standards, they’re not giving you the respect that you deserve. They are the one with the problem, not you. Some people will never respect the boundaries you set and will not change their behaviour. If they don’t respect your boundaries you may need to examine what position this person will play in your life. You may find that you need to create some distance between you and family members. You are not being selfish or demanding, you’re simply practising healthy self-care. Not every toxic person needs to be cut out of your life but sadly sometimes, someone may be too toxic to you for you to justify keeping them around. You can’t change the past but you can take control of your future. It’s not easy distancing yourself from family but sometimes this is the only answer and absolutely necessary. The key is in the intent. You’re not doing this to intentionally hurt or punish someone but to protect yourself so let go of the guilt. When you cut out toxic people from your life, they will often turn the story around and blame you for the conflict. Hard as it may be, ignore their behaviour. Those people who believe their lies and pass judgement without proof, may be best avoided too. Never give up on your own emotional and physical health by tolerating disrespect and abuse by a toxic family member. Sharing the same bloodline simply means you are related but it doesn’t make you family, love does.